The Church of England has said it will keep its shares in Amazon – a day after the Archbishop of Canterbury said the firm was “leeching off the taxpayer”. The Church Times has revealed Amazon was among the 20 biggest global investments by the Church last year. A statement from the CofE said it considered the most effective way to seek change was to be “in the room with these companies” as a shareholder. Amazon has repeatedly said it pays all taxes required in the UK. 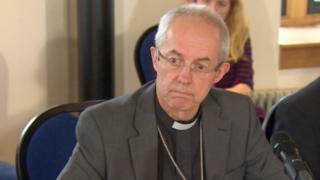 Archbishop Justin Welby, in a speech to the Trades Union Congress on Wednesday, said: “When vast companies like Amazon and other online traders, the new industries, can get away with paying almost nothing in tax, there is something wrong with the tax system. His comments came a week after he told the BBC there needed to be a fundamental rethink of how the economy works, including higher taxes on technology giants and the wealthy. Should tech companies be paying more tax? The 2017 annual report from the Church Commissioners, which deals with the Church’s investments, revealed Amazon Inc was one of its top 20 global equity investments. A statement from the Church said: “We consider aggressive tax avoidance or abusive tax arrangements to be both a business risk and an ethical issue. “As with other issues, we take the view that it is most effective to be in the room with these companies seeking change as a shareholder. The Church made a return of 18.6% on global equities in 2017. In 2014, the commissioners sold around £75,000 of shares in the payday lender Wonga after the archbishop pledged to “put it out of business”. He had admitted to being “embarrassed” and “irritated” when details of the link emerged in 2013. Last week, Amazon briefly became the second US-listed firm to have a market value of more than $1 trillion (£779bn).